We had to make an emergency trip to Vegas to visit James’s mom. She was in the hospital with what turned out to be a heart attack and had massive amounts of fluid around her heart and lungs. She’s fine now. The good news is her arteries are all ok, but she can be rehabilitated. But she has a long recovery ahead of her. She’s out of the hospital and resting at home. On the way to Vegas, I got a call from one of my prospective new employers. After several interviews, I was told that I was one of two top candidates and I would have to have a (third) interview with the Artistic Director. Well, she called to say that basically someone else, who knew the AD, put herself up for the job and and was hired. And thanks for going to all the interviews, and if this girl hadn’t come forward, they would have chosen me. It was all I could do to keep from crying while on the phone with her. Afterwards, I broke down. It’s so hard to stay positive when I have been to so many interviews that have gone nowhere. I just don’t know what it is that I am not showing to these people. On the way to Vegas there was a huge stormcloud and a lightning storm over some of the mountains. As I was watching it I noticed the biggest rainbow I have ever seen in my life. It went half way across the sky and literally touched the ground. It was so beautiful. If only I could have gotten to it. Who knows what I would have found. Perhaps a pot of gold? It made me feel a lot better. James and I have been cleaning the house from top to bottom since Labor Day weekend. It’s a slow process but I am feeling good. Getting rid of stuff, repainting stuff. Labor Day weekend was absolutely horrible. The temperature went up to over 100 and it was over 90 degrees in our apartment. Then the power went out. Nice. For two days. Even better. But we survived. One of my assistants, who I loved, was taken from my unit and put in another. I miss her. So I told her I would make her something. And here it is! 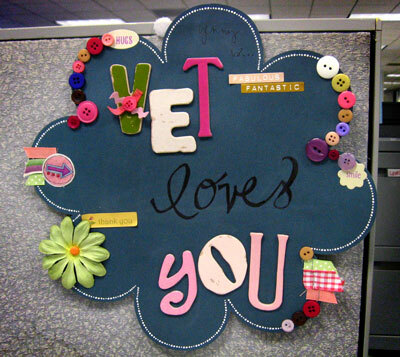 It says “Vet loves you”. (VET is the name of my unit). Isn’t it cute? In other news. My dad has started a business with World Ventures. It’s like a travel agency that has two parts. The first part has a search engine for trips. You can view it here. You can search for hotels, car rentals, or flights. They have a downloadable toolbar the can run searches on trips while you are on the net. The second part is you can sign up to be a travel agent yourself and they have something called DreamTrips for the agents. They provide 20 different trips a year for the agents at ridiculously low prices. It’s quite exciting! You can check it out here. That’s what’s been going on with me for the last two weeks. Oh! Our 1 year anniversary is on Sunday!! First of all it’s good to hear that James’ mum i OK and will be recovering well. Secondly I have to say that you are obviously not doing anything wrong in your job applications and interviews. This last one absolutely proves that. If someone hadn’t pulled the ‘mates’ card you would have got it. In other words you were the best for the job but she just got it because she knew the AD. This means that if you keep going you will eventually hit a job where there is no ‘under the table’ deals and you will get the job you’re meant to have. Don’t lose faith in yourself. aw leslie, i’m sorry about the job. i totally get how much of a strain an annoying job can put on you, but i’m glad that you are still looking up! love your little send off gift and can’t wait to see more scraps from you soon! So sorry to hear about James’s mom and about the job situation. Don’t get discouraged, though. Keep at it and I KNOW you’ll find something. I don’t think it’s that there’s something you’re not showing to these employers. I think it’s just matter of finding the one that’s right (just like you told me when I was trying to buy a house!). The last time I was looking for jobs, I went through something similar. I went through six grueling interviews (2 each for 3 different schools in the same school district) in about three weeks. The first job was filled by a teacher who already taught in the district, the second was filled by a student teacher, and finally I was offered the third only because someone else turned it down. Even then, after thinking about it thoroughly I realized it wasn’t the right job for me in the first place, so I turned it down! All that for nothing. It wasn’t until I had basically accepted that I wouldn’t be finding a new job that my current job popped up. After going through what I had with the other jobs, the interview process seemed so easy and went so smoothly! They always say that you find the best things when you’re not looking for them at all. Hang in there, and remember your rainbow! Leslie, I am sorry you didn’t get the job. It sounds like you were their pick, but someone else (in-house?) got the job. NOthing to be ashamed of there. I hope James mom will be well soon. I’ve been having some medical challenges too, with my husband. Rainbows are really good signs, you know. I think it was meant to tell you that everything would turn out okay. Hi hon! I am glad that everything is ok with your MIL. I promise you…you will find a job that is meant for you. It is their loss. You are a Filipino and it doesn’t get better than that! LOL! Keep your head up! I’m thinking about you in Florida!